Introduction: Gena Philibert-Ortega is a genealogist and author of the book “From the Family Kitchen.” In this guest blog post, Gena writes about the challenge of locating your ancestor’s burial place—and explains how to find out if a cemetery has been moved. 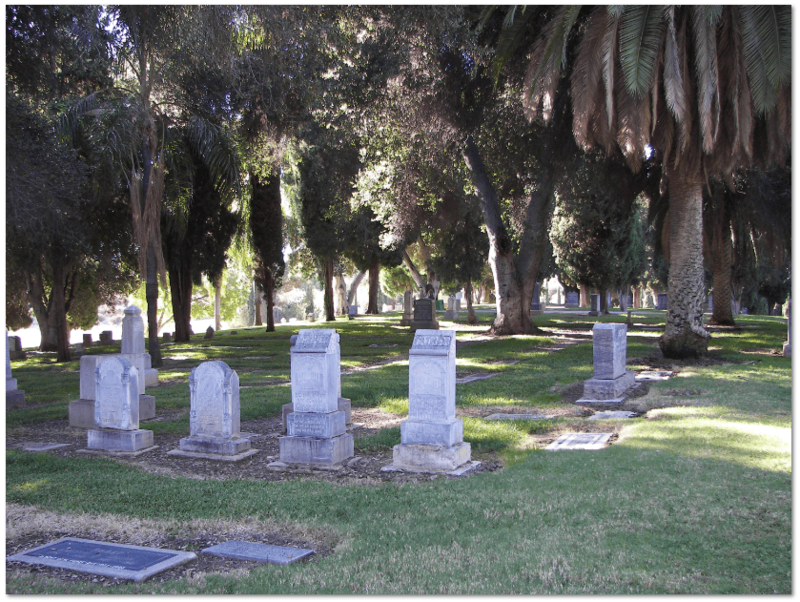 Most genealogy articles written about cemeteries focus on how to find your ancestor’s final resting place. These articles describe resources available (both online and off) for finding cemetery transcriptions and obituaries. Having written a book about cemeteries in a region of California, I am always amazed when we are able to find an ancestor’s burial place. Sometimes our ancestors are not buried where we think they should be. What can you do when there seems to be no mention of an ancestor’s burial place in any resource? Not all cemeteries are places of eternal slumber. For a variety of reasons cemeteries may be repurposed, burials may be disinterred, and grave markers may be stolen or succumb to the elements over time. In my own years of genealogy research I have seen cemeteries reclaimed by nearby lakes and rivers, plowed over for golf courses, grave markers destroyed by vandals, and cemeteries repurposed for city projects. If you are able to visit the grave of an ancestor, consider yourself lucky. We often think of newspapers as a place to read articles specific to an ancestor’s burial such as obituaries and funeral notices—but what if you need to know more about a cemetery? Old newspapers are a great place to learn about the history of a specific cemetery, or information about cemeteries in a city. Need historical background to help you ascertain whether an ancestor could be buried in a particular cemetery? Curious what happened to a cemetery? Looking for a cemetery history? Newspapers can provide this type of historical information. Where did the cemetery go? A San Francisco newspaper example. While the examples of what can happen to a cemetery are endless, let’s look at one well-known example of how a whole city decided that they would move their dead. Have a 19th century ancestor that lived in San Francisco? It makes sense that they would be buried there—and they may have been, but only temporarily. 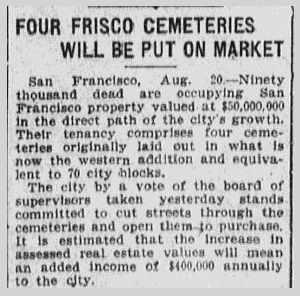 In the early 20th century, San Francisco decided that its real estate was too valuable to be “wasted” on the dead. What happens when a city decides to evict its dead? Family members of the deceased were contacted and legal notices were included in newspapers. Effort was made to contact family members of the deceased so that alternative arrangements could be made. In a case of one of my cousins, her family saw to it that their great-grandmother was reinterred in Sacramento along with a new marker. What happened to those deceased who were not claimed by kin? Their gravestones were used in building projects such as the construction of seawalls. Unidentified remains were placed in mass graves. As you search for the burial place of your ancestor, consider what time may have done to the cemetery. Acts of nature, the deterioration of time, city council decisions, or criminal acts may have destroyed the cemetery or gravestone, or at least made it impossible to identify where your ancestor is buried. Before you decide that it is hopeless to find your ancestor’s burial place, take time to research the history of the area—which in turn can help you better understand the cemeteries in that area. To read more about San Francisco’s cemeteries and Colma see the book Colma (Images of America series) by Michael Smookler. * From Town of Colma: Welcome to the Town of Colma. http://www.colma.ca.gov/. Accessed 17 March 2013. Your blog struck a cord. I’ll E-Mail you an article I’m writing about searching, and eventually finding, my Great-greatgrandmother in Colma. But she was buried there in 1902, the rest of the family later. 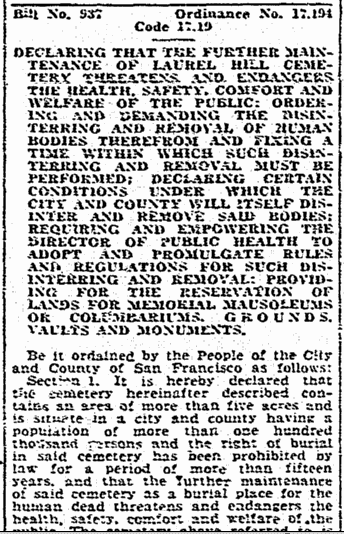 My search was also hindered (as I found out later) by the loss of all the San Francisco Vital Records in the Earthquake and Fire of 1906. Enjoyed the Blog. Your research confirmed a number of things I commented on in my article. Thanks for your kind words. I don’t know if you’ve looked at Google Books but there are books from that time that provide some great background history on this topic. I was also amazed at the amount of newspaper articles that discussed closing San Francisco to burials. Good luck with your article and your research. Unfortunately, too many cemeteries lie in disrepair and are eventually claimed by the elements. That’s why documenting these cemeteries and trying to recreate a list of who was buried there can be so important. When a “pioneer” cemetery is in disrepair, community members may want to consider getting the local genealogical or historical society or even a Boy Scout looking for an Eagle project to get involved. Materials do exist for teaching how to cleanup and repair markers. Conducting interviews with residents can also be so important. Your memories of saving your own great-grandparent’s burial place is a good example. When I was writing one of my books it was only through the memory of one person that I was able to tell the story of a cemetery that had not existed for decades. For verifying your husband’s grandparent’s burials, consider searching the Family History Library Catalog for the place where the cemetery is located. Then see if any cemetery transcriptions have been done. It could be that someone in an earlier time wrote down who was buried in that cemetery. Don’t forget to look in newspapers for information about that cemetery as well. I have a mystery in my husband,s Davi(d)son family. I have researched everything I can find on burials where Alexander Davi(d)son lived in Pa. He died in 1739 Strasberg, Lancaster co. Pa. according to record but I cannot find him in any cemetery in the area although I have located and seen where his son and grandson ,John and Samuel are buried close to Lancaster , Pa.
What were the circumstances around his death? That could also hold clues about the burial. It’s always a good idea to switch hats from genealogical research and concentrate on local history to gain clues regarding practices and records that may not be as obvious. To do this, check catalogs like NUCMC and ArchiveGrid , as well as academic and state libraries . Local and state historical societies can also have important manuscript collections and histories. I have a death cetificate from Maricopa County Arizona stating that my husband’s great grandfather is buried in Greenlawn cemetery in 1943. Greenlawn cemetery has no record of anyone being buried there with the name Pinkerton in that year. Any suggestions as how to proceed? I have seen death certificates have the wrong cemetery listed, so that wouldn’t be too unusual. So you either have a situation where he is truly not buried there or there is a transcription error leading the cemetery to not find him listed in their records. Have you looked for the obituary to see if that provides clues about the burial place? If you have looked for an obituary and haven’t had any luck, consider searching the Mesa FamilySearch Library’s Arizona Obituary Search . You may also want to check other cemeteries in the vicinity. This could be done by using an online website like Find A Grave and by checking transcriptions available through the Family History Library Catalog. Is the funeral home that took care of the arrangements still in business? If so, you may want to contact them for a record and see if that confirms the Greenlawn burial. If they aren’t in business, it’s possible their records were donated to the state archive or are kept by a funeral home that took over. Very interesting articles. I have been President of the Lady Dunn Cemetery Association, a state licensed voluntary association which was formed for the purpose of trying to save the old Dunn Cemetery which is located at London, West Virginia. This cemetery served the communities of Cannelton, Carbondale, Handley, Longacre, London,, Marting, Montgomery, Smithers and several other small towns, most of which were coal mining communities. Many of the graves have no markers, but in many cases, neither coal miners, their doctors or company officials, especially in earlier times, filed no official reports of deaths among local coal miner families. Thus, in many case tombstones that standing in the old Dunn cemetery contain important genealogical information that is not present in state records or anywhere else. This cemetery has been in operation since the early 1830s, but it was largely abandoned during the 1950s. It stands on land owned by the Alpha Energy Corp., a mining company which may be involved in bankruptcy proceedings at present.. When our association was formed, the cemetery had not been maintained for for many years Thus, a great many graves had been damaged by the elements, falling trees, etc. Our members have contributed their own labor and money for the past ten years in order to begin the work of saving this historic cemetery. However, the cemetery is remains at great risk.